North America (August 31, 2017) – Last month, Brasserie St-Feuillien brought another fabled brew to North America – its Grisette Blanche Wit, which received a gold medal at the 2016 World Beer Awards from an international jury of experts who blind-tasted over 1,500 beers from 32 countries. Certified organic in early 2016 (applicable to bottles only), Grisette Blanche Wit won gold in the Belgian Style Witbier category. It is now available in the U.S. as a keg-only offering. Grisette Blanche Wit has been added to St-Feuillien’s U.S. portfolio which includes its Saison, Triple, Brune and Grand Cru. So far, sales have exceeded expectations. Hensenne points to the combination of thirst quenching body, piquant coriander and orange aromas and an extremely competitive price point as reasons for Grisette Blanche Wit’s early success. “Grisette Blanche Wit is our top seller in many countries, and it’s on track to be our best seller in the U.S. as well,” Hensenne says. Brasserie St-Feuillien (pronounced FOO-yen) of Le Roeulx, Belgium stands out not only because it’s been producing top-quality abbey ales since 1873, but it has remained in the same family for its entire tenure, save for an 11-year hiatus from 1977 to 1988. The Friart family is now in its fourth generation of ownership, ensuring the abbey brewery’s values of consistent quality and time-honored tradition hold true. St-Feuillien’s water source comes from an artesian well within the brewery itself, that draws from a spring 65 meters beneath the brewery. The water is naturally filtered by the bedrock, making for an extremely pure and unique source of brewing liquor. 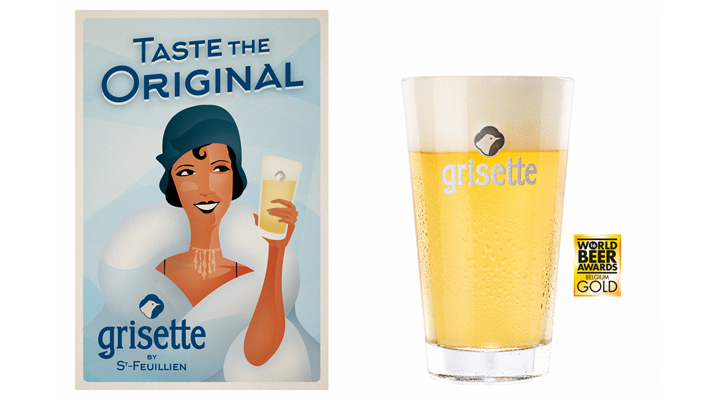 Interested in selling Grisette Blanche Wit at your restaurant, bar or retail store? Interested in becoming a distribution partner for Brasserie St-Feuillien? Please contact Lanny Hoff for details. For interview opportunities with St-Feuillien export manager Pierre Hensenne or owner Ms. Dominique Friart, or for more information about Brasserie St-Feuillien, please contact Lanny Hoff at +1 (612) 245-5433 or by email at lanny.hoff@artisanalimports.com. About Brasserie St-Feuillien: Brasserie St-Feuillien (“Foo-Yen”) is the maker of some of the world’s most highly regarded Abbey Ales including the notable St-Feuillien Grand Cru, Saison, Blonde, Brune and Tripel. The brewery started in the 7th century, when an Irish monk named Foylan, a name which later morphed into the more French “Feuillien”, was killed in the village of Le Roeulx. A chapel was built in his honor that became the Abbey St-Feuillien du Roeulx. The St-Feuillien brewery has been operated by the Friart family since 1873, and its beer is among Belgium’s oldest and most authentic Abbey Ales. Learn more at www.st-feuillien.com.